You can dilute your 10% Betadine with distilled water to 5% but dilute it in a separate container right before the application. Do not reuse the diluted solution - discard it. Leave it on the skin for at least three minutes and do not forget to rinse it off with water before you start rolling. Please ignore the many typo's and grammatical errors in this table - it comes from an Indian publication. Dermarolling / Microneedling / Tretinoin cream or gel for deep stretchmarks loose skin on stomach? 0.05? or 0.1%? No, you do not have to replace the Infadolan tube if it has small cracks. You can roll with the one liner dermaroller right afterwards or later. If you have lots of stretch marks, do not roll all your stretch marks in one go with the one liner dermaroller. Spread it out and roll thoroughly just a few each time. Dermarolling / Microneedling / Questions re: Facial Dermarolling, Retin-A, CPs, VitC cleansers. >1). May you please advise as to which size dermaroller i should choose? You could use the 1.5 mm roller on your face as well but rolling your abdomen to improve stretch marks and sagging skin is quite a large area and you need a sharp dermaroller for that. If you use it also on your face, it will get blunt sooner. >2). a) Is Retin-A totally necessary to achieve noticeable positive results with >dermarolling? No, it is not necessary to achieve results. Some people cannot use Retin-A because it irritates their skin. Tretinoin (Retin A) is useful in certain skin conditions such as acne prone skin, hyperpigmentation, stretch marks, sun-damaged skin and dull skin, provided it doesn’t dry out or irritate the skin. >b) Can the Infadolan cream be used alone, instead of retin-a? These two products are not interchangeable. Infadolan is indented for dermarolling aftercare. It protects the dermarolled skin. In your case, you should use it after rolling your stretch marks with the 1.5 mm one liner dermaroller or your abdomen with the regular 1.5 mm roller. You do not have to use it after rolling your face with short-needled rollers such as a 0.5 mm roller but keep the skin moisturized. >3). a) Are Copper Peptides necessary to achieve the results im looking for with >dermarolling? Dermarolling works all by itself so nothing else is necessary to get results. Our products (mainly vitamins) are an additional help to enhance those results. You should keep the skin well moisturized after dermarolling. That is important. >it have to be the L-Ascorbic Acid version of vitamin C? It doesn’t prove that it had no effect on collagen production since this was not studied but further studies are necessary to find out. So keep using the acidic form (ascorbic acid) as well since this form did increase the levels in the skin. >c) How should you treat your skin prior to application of the VitC? Do not use alcohol, it dries out the skin too much. I wash my face with a little bit of diluted shower gel, rinse it off with tap water, I pour vit. C serum on a cotton pad and apply it to my face. About half an hour later I sprinkle a cotton pad with tap water, add some almond oil and apply it to my face. If you do not use very oily daily creams, you can apply vit. C without wiping the oils off your skin first. Dermarolling / Microneedling / Stretchmark dermarolling advice please re. individual needling per scar. Cleopatra, I certainly do not mean to deter your from dermarolling your face but since you described your stretch marks as "EXTREME", you also want to roll for sagging abdominal skin and you have two children to look after, you will likely have no time to concentrate on both your face and on your abdomen. Treating stretch marks is quite laborious because the most effective treatment is to roll each stretch mark very thoroughly with the one liner dermaroller or needle it with the single needle. I will answer your question as soon as I have time. University of Pittsburgh Medical Center, Pennsylvania, USA. During the past 50 years, many clinical reports have identified nicotinamide as a beneficial agent in the treatment of a variety of inflammatory skin disorders; what's more, its exceptional safety profile at pharmacologic doses makes it a potentially ideal long-term oral therapy for patients with inflammatory skin diseases. A recent large study evaluating nicotinamide for the treatment of acne or rosacea has confirmed the potential benefits of oral nicotinamide as an alternative approach to managing inflammatory lesions associated with acne vulgaris and acne rosacea. This article reviews the substantial number of reports published over the past 50 years that document the clinical utility and safety of oral and topical formulations of nicotinamide for the treatment of a variety of inflammatory skin conditions. Most vitamins have an anti-inflammatory effect, which is indeed good for the skin. You can apply your cream the days before and the days after. To be honest, I do not know whether your cream affects the inflammation so strongly that it should be avoided right after dermarolling with long needles. You can try applying it immediately after dermarolling and compare the signs of inflammation to dermarolling without the cream. (you can shorten the five-week interval to A four-week interval). >use your Derma Roller and Tretinoin & Vit C Serum? If you have the patience, you can realisticly improve skin laxity on the post-pregnancy abdomen. A 1.5 mm regular roller is the best for this. >If so, should i be using the 1.5mm roller or 2mm, please? 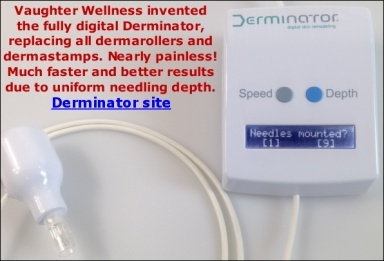 The fewer needles a dermaroller has, the deeper they penetrate. A 1.5 mm one liner penetrates as deep as a regular 2 mm roller. Thus your stretch marks will be intensively and deeply treated. Regarding the crepey skin of your abdomen, start with a 1.5 mm regular roller. If you get no results after one year, try a 2 mm regular dermaroller. >And 0.05% Tretinoin or 0.1% tretinoin, please? There is no need for really high percentages. 0.05% is already high. Do not apply Tretinoin if you are pregnant, lactating or planning a pregnancy. >session, or 1x or 2x per day? You should massage Tretinoin cream or gel into each stretch mark after dermarolling them individually and intensively with the 1.5 mm one liner. You should wait three weeks before you roll again with the 1.5 mm dermaroller. You can roll every second day with the 0.2 mm dermaroller in between rolling with 1.5 mm. If the skin gets irritated, reduce the frequency of rolling. When we have our own Tretinoin cream (hopefully at the end of January) we can send it to Denmark and any other EU country (or anywhere else in the world). There is no need to apply it more than once a day but there is no danger in applying it more often. >when the skin is still "open"? Dermarolling / Microneedling / Help! Dermaroller infection???? If the roller has first been thoroughly cleaned and then properly sterilized, then there will be no skin detrius present to form a basis for bacteria to grow on, especially not because the roller head will become totally dry in less than a day, when stored at room temperature. You can for that purpose use a 1% solution, and because the roller is already clean and pre-sterilized, just a few minutes will do, instead of the usual half hour for that percentage. But it really shouldn't be necessary. It is a good idea but do not mix them together. Either apply them in turns or apply vit. C serum first, let it penetrate the skin and then apply avocado oil. Dr. Roller does not sell directly to individuals, it's a huge factory in South Korea called Moohan Enterprise Co., Ltd. and the minimum order quantity is hundreds of dermarollers so you must have purchased your Dr. Roller from some other company.. Try finding the order confirmation email from when you bought it. You can also look at your bank statement for the name of the company that received your money. Sorry not to be able to be of better assistance. Yes, if your skin can tolerate it, follow your regimen. The skin may become irritated, red and overly flaky as a reaction to retinoids. If it happens, reduce the frequency of application or apply it without dermarolling. Concerning retinoids, the more is not always the better. Do not apply Tretinoin (A-Ret) if you are pregnant, lactating or planning a pregnancy. It sure is, isn't it... I can roll anywhere on my face and body without a numbing cream with the exception of above and around the lips. I use a numbing cream there. >hope to get rit of it. I think the freckles suit you! It can't be gleaned from the photo but if the skin on your face looks like the peachy smooth skin on your décolleté, you could be a skin model. The pigment that makes the color of our skin is called melanin. It is produced by cells called melanocytes that are at the bottom of the epidermis. Freckles are basically small areas of skin that contain more melanin than the freckle-free rest of the skin. It is unknown why the skin produces more melanin in certain areas. You cannot prevent melanocytes overproducing melanin but you can reduce the amount of melanin in your skin by for example melanin inhibitors (some have side effects with prolonged use), acid peels etc. Melanin is our natural UV filter and the skin produces more upon the sun exposure. Melanin-related pigmentations (which is majority of pigmentations) reappear upon the sun exposure. Dermarolling will not get rid of freckles. It may make them lighter. Rolling frequently with short-needled dermaroller is likely the most efficient for this purpose because it speeds up the turnover of the epidermis. Your melanocytes will however continue with overproducing melanin in those areas and some kind of lifetime maintenance and meticulous sun protection is necessary. You can also try a pigmentation laser. The light from the laser is absorbed by melanin pigment. The absorbed light heats the melanin up and thus destroys it. >weeks do I have to dermaroll before getting results? You can roll again in three weeks. It is difficult to give a precise answer concerning the results. Some people see improvement already after the first rolling, some after half year or rolling. Those with acne scars often see improvements only after a year and a half of rolling. >is it ok to dermaroll with 1,5 around eyes (not to close ad the eyeball) and neck?